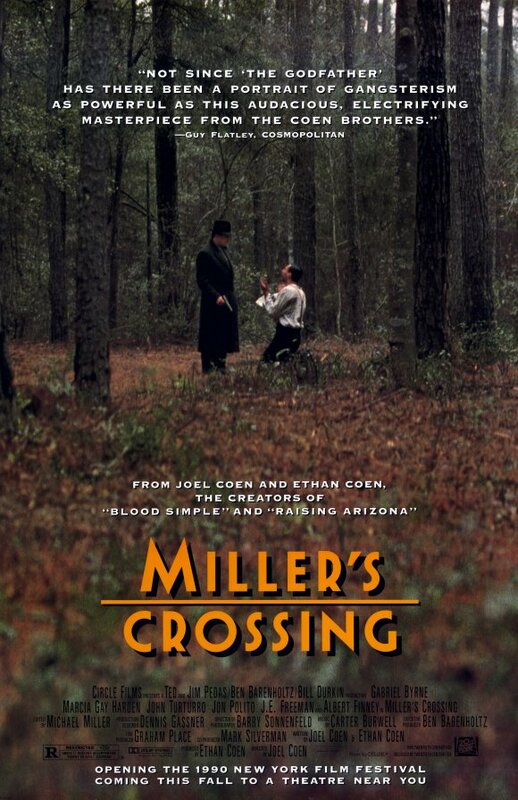 Loosely based on Dashiell Hamett’s ‘Red Harvest’, ‘Miller’s Crossing’ is an intelligent gangster film shot in the style of a film noir, directed by Joel Coen, and produced by Ethan Coen and Mark Silverman. The film centres on Tom Regan (Gabriel Byrne), who is the “right hand” of Leo O’Bannon (Albert Finney), an Irish-American political boss, running a Prohibition-era city somewhere in the US. Leo has a “beef” with Johnny Casper, a gangster and his Italian rival. Leo’s girlfriend is Verna, whose brother Bernie Bernbaum has a contract on his life and is wanted dead by Casper. The idea here is that by “giving” Bernie to Casper to kill, Leo and Casper can come to a peaceful understanding and agreement. However, Leo is reluctant to do so because of his girlfriend, who wants to see her brother alive. Tom thinks that Leo is making a mistake. However, Tom also has an affair with Verna, seemingly being in love, and therefore is also, at least “deep inside”, is trying to protect her. When Tom starts to “play” both sides, some unexpected events start to take place.